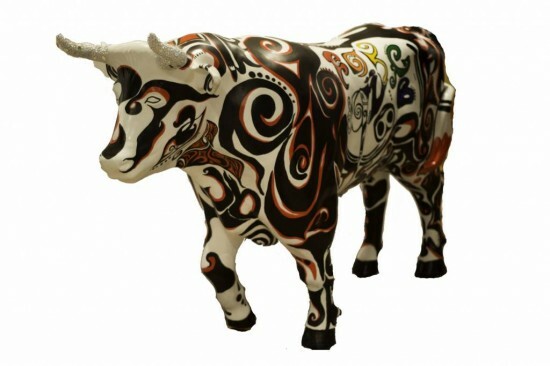 Arty the Ox developed through a group conversation about how we, The Pennington School Art Club, could best represent our motto– making everything beautiful for all. Pennington’s art students continuously embark on artistic adventures that create beauty for others. We’ve revamped, restored, and decorated buses, garage walls, office walls, classroom stools, holiday trees, and much more. We like making beauty, collaborating on ideas, and sharing with the world our artistry. Arty’s design was originally created by our 8th grade member, Jessie and was then tweaked by Liz, Annie and myself. Jessie’s black, white and red design won the votes of the twenty-two students in art club for having the best representation of The Pennington School. We considered making the oxen face a Red Tail Hawk, our mascot, but decided instead to keep the oxen shape intact and morph our maze like designs into the ebb and flow of the structure. Hidden within the image are elements of Pennington Art – a palette, paintbrush, pencil, our Cupola, and the words ART CLUB and TPS. We used latex based paints. The horns are bejeweled with plastic gems using epoxy. Our color scheme is black and white with hints of medium red--our school colors. We also included the colors of the color wheel on Side 2 (red, orange, yellow, green, blue, violet). We liked the idea of Arty “painting the town red” so we detailed the end of his tail as a paintbrush dipped in red paint.